JP 2013-03-27 ¥571 (600) ? 3D Super Hang-On (3D スーパーハングオン), is a downloadable remake of Super Hang-On for the Nintendo 3DS and is part of M2's 3D Classics range. 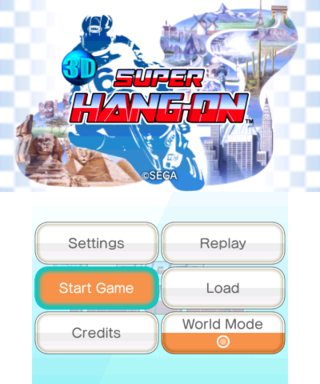 3D Super Hang-On is mostly identical to the arcade version of Super Hang-On, though has been altered to make use of the system's 3D capabilities. The visuals have also been adjusted for the console's 16:9 widescreen display, gyro controls have been added and various new options are available, including difficulty, screen size and handling adjustments and the ability to save progress at any time. The game also has an unlockable "World Circuit" that has the player go through all four circuits in one session. Main article: 3D Super Hang-On/Magazine articles.